Dell's gaming-centric Alienware brand has gone down the console form factor route with its Alienware X51 PCs. The erstwhile X51 though has recently had a little open-heart surgery to give it a new Ivy Bridge beat to its processor rhythm. The X51 is about the same size as the original Xbox 360 and is obviously angling this machine deliberately as some sort of simpler gaming machine compared to the normal desktop giants. That said it does have the look of an angular corporate chassis from the HR department of some Men in Black-style organisation rather than a 1337 gaming box. But this is being targeted as a gaming machine, capable of delivering "an immersive HD gaming experience so you can meet any challenge", so says the Alienware concession housed in the Dell website. While it's certainly capable of reasonable HD gaming performance, I think it's going to struggle to meet any challenge. And the 'graphics for greatness' tag is rather overselling the meek little Nvidia GTX 555 graphics card humming away inside the cramped chassis. 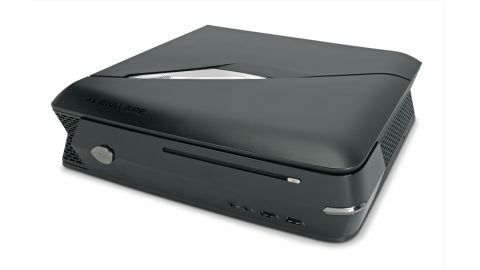 Having said that though, you have to admire Alienware for sticking to its desktop guns. It would have been easy to try to knock out a small form factor desktop machine using notebook parts, a la the nettop. The much-maligned nettop. So it's with pleasure that we see the meek little GTX 555 is a proper desktop variant, with dual-slot cooling and a proper PCIe 6-pin power connector. While it's no gaming powerhouse in graphical terms - with 288 CUDA cores and a 192-bit memory bus it's not going to be setting the world alight with flying polygons - it's still way ahead of a lot of the mid-range notebook graphics around. In fact this OEM only card seems to be almost identical to the GTX 560 SE that was released by a few add-in board (AIB) partners in the spring. The version we've reviewed has got the original Intel Core i7 2600 inside, but for the same price Alienware has replaced that chip with the new Core i7 3770. As you'll know from our Ivy Bridge coverage there's not a lot between the two chips in performance terms, certainly not in gaming performance with a discrete GPU. So what actually is going on inside the X51? Well, it's a rather smartly designed and well-engineered machine, managing to squeeze all the necessary desktop components into a diminutive form factor. The motherboard Alienware is using inside is a tiny H61, with a pair of DIMM slots and one x16 PCIe 2.0 connection. In order to maintain the clean, pseudo-corporate lines the graphics card is connected via a PCIe riser board, which allows the card to be mounted parallel to the main motherboard. To be honest, the engineering around the graphics card is the most impressive thing about the X51 and the fact that it is relatively simple to remove and replace has to be applauded. So long as you can find a graphics card of a similar sort of size to the OEM GTX 555 then you'll be able to find a home for it. In fact, the GTX 670 fits inside nicely, and with the 150W TDP of the GTX 555 you could expect to be able to find the juice in the 300W PSU of the X51 to keep it juiced-up happily. There's even a spare 6-pin PCIe power connector inside the chassis just waiting for a more powerful graphics card to take its place inside. In those twin DIMM slots lies two 4GB sticks of 1,600MHz DDR3, in dual channel configuration. A full 8GB of system memory is more than enough for any game you care to throw at it and, in fact, for most productivity tasks too. The only really sad note is that, while it's laudable that Alienware is offering the Ivy Bridge i7 for the same price as the i7 2600, it's not changing the chipset it sits in. Alienware is using the self same H61 chipset for the Ivy Bridge CPUs as it does throughout the rest of its lineup. That makes sense for the build of the machine, keeping to the same layout, but it means you're losing some of the goodness of the new platform. Most notably the native USB 3.0 and PCIe 3.0 connectivity. The first isn't a massive loss as there are still two USB 3.0 sockets, though not native, sat on the rear of the H61 motherboard. The lack of PCIe 3.0 connectivity is somewhat more of a problem - maybe not now but moving forward with this machine it might be. The actual design of the chassis is another concern. There's nothing really wrong with the build quality of it, and the way it has been designed to fit full desktop components into a small form factor is excellent, it's just that it feels so flimsy and plasticky. There's a lot of give in the surrounds of this machine, something that doesn't exactly scream £900 worth of quality. In terms of raw performance you'd have to say the Alienware X51 is no behemoth of the gaming world. It's most definitely capable, but it's a bit of a stretch to see this as on par with any other £1,000 rig out there on the market. Granted prices of gaming machines have risen with the latest round of graphics card and CPU releases, but even the sub-£1,000 rigs we've tested since the Sandy Bridge launch have the edge in terms of performance metrics. Indeed, if you look back 12 months we reviewed the Chillblast Fusion Rocket, a £750 Sandy Bridge machine with the excellent AMD HD 6950 as its graphics grunt. The Core i5 CPU came overclocked, which gave it CPU performance rather close to that you'll see from even the Ivy Bridge chip. Which you'll note isn't one of the 'K' series CPUs, and as such has the locked multiplier that these days means no overclocking allowed. With the geriatric-looking CPU cooler sat inside the X51 that's probably for the best though. In games performance too the old Chillblast machine has the edge, posting double the Metro 2033 performance of this Alienware rig. The DirectX 10 performance of the Nvidia GTX 555 makes things much closer, but then you don't buy a new, gaming-branded machine for around a grand and hope that it'll cope with games a generation further back in time. You buy a £1,000 gaming PC to play the latest games and to play them well. Sadly, even at 1,920 x 1,080, you know the Full HD that Alienware is talking about on its site is lacking with the GTX 555. So despite having serious desktop rig credentials - offering full access to the CPU, giving the option of upgrading the GPU at a later date - the Alienware X51 doesn't quite have it where it counts. The form factor may be pleasing, but you're certainly paying over the odds for the sort of gaming performance you'll see spat out at the end. It's a shame that Dell isn't offering the machine as a barebones system for a decent price. Being able to drop in your own CPU and GPU combo would make this a far more appealing proposition. A low-powered Core i5 2500 with a tasty little GTX 670 would make for one serious gaming rig, and would make mincemeat out of this gaming also-ran.